America in 2004 is color coded--and it's not just a matter of red, white, and blue. The terror alert bounces from yellow to orange. The economy offers up a hundred shades of red ink. The environment is turning brown. National security is cloaked in gray shadows. 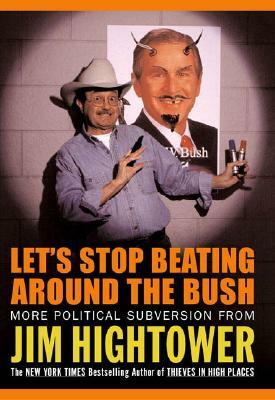 And Jim Hightower covers it all with uncommon insight, political fearlessness, and laugh-out-loud humor. America's #1 populist gives us Let's Stop Beating Around the Bush--a hard- hitting, fact-filled review of the real state of the union that you won't get from the establishment media. With his daily radio commentaries and award-winning monthly newsletter, no one has chronicled the madness of King George the W, the wimpiness of corporate Democrats, and the aggressive avarice of Wall Street with the thoroughness and tenacity of Hightower. Now he brings that investigative punch into this wild and woolly book of fiery essays. With his satirical "Six Perfectly Good Reasons to Re-elect George W. Bush;" his mix of damning indictments and uplifting stories; and side bars, cartoons, games, and puzzles, Hightower has done the impossible: He has created a subversive read that makes politics fun again.